The right tool for any job. Whether you’re constructing a building, a road, or anything else of substantial size, you probably have heavy materials that need to be moved around the jobsite. Brentwoods make this task easy, allowing you to transport materials such as brick, stone, and dirt without breaking a sweat! 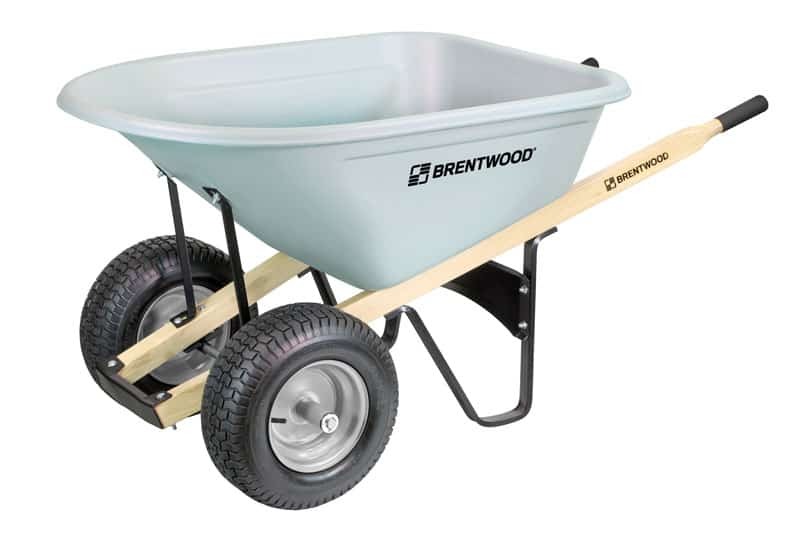 Brentwood wheelbarrows are particularly handy for concrete applications with the easy-to-use pour spout and HDPE pan. You can mix your materials directly in the pan, utilize the spout for accurate pouring, and easily remove hardened concrete from the pan surface. Landscaping can be a big job depending on the complexity of the project. Brentwoods can ease the load – literally – by helping you move heavy materials like soil, sand, and stone with minimal effort. Wheelbarrows serve many uses on farms, whether you’re seeding, collecting ripened crops, or caring for animals. The turf tire on Brentwood wheelbarrows easily maneuvers through fields and stables without tipping or spilling your load. Whether you often find yourself in the garden or are a do-it-yourselfer, a Brentwood wheelbarrow can simplify any project in and around your home. For help choosing the best Brentwood wheelbarrow for your application and to get pricing, contact your local distributor.